In Longevity Now, Wolfe exposes the number-one cause of all degenerative illness and aging: calcification. Caused by an excess of calcium and the presence of nanobacteria, calcification can be found in some degree in virtually every adult and even some children. It leads to a plethora of illnesses and manifests as achy joints, hardened arteries, cellulite, cysts, kidney stones, gallstones, dental plaque, cataracts, and bone spurs, among many other health problems. By breaking down calcification and removing parasites, heavy metals, and other "unwanted guests" from your system, you can reverse the aging process and eliminate the prospect of degenerative disease from your future. Part 1 of the Longevity Now Program focuses on supplements to dissolve the buildup of calcium in your system, leading to freer movement, a clearer head, and a lighter step. Part 2 focuses on boosting your immunity, using a variety of supplements to make your body as resilient as possible. Part 3 focuses on rejuvenating each and every cell of your body with nutrient-packed supplements and superfoods. Part 4 focuses on using special electromagnetic grounding technologies to eliminate parasites and reconnect you with the rhythmic cycles of Earth's energy field. Part 5 focuses on deep-tissue bodywork and yoga, so that you can move blocked energy around and break up stagnation in typically unaccessed parts of the body. 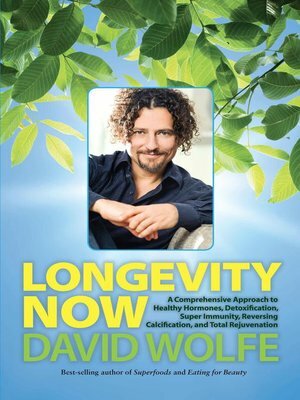 In addition to all this, Wolfe offers abundant additional information to help you more fully live the Longevity Now lifestyle, such as foods to avoid, healthful alternative sweeteners, delicious recipes, and more tips and tricks to keep you on the path of rejuvenation, radiant health, and full-throttle vitality.